..."Interesting piece by Diana in Guam whom seems to be handling this with amazing skill! However, parishors in Guam should be thinking how many Catholics have left the Church because they have lost their Faith and have gone back into the world seeking their happiness! ..."How do we bring them BACK?" ü Founders: Kiko Argüello, a painter, and Carmen Hernandez, a graduate in chemistry and theology, who met in the shanty town of Palomeras Altas, on the outskirts of Madrid, Spain, and developed a program for evangelizing the slum’s residents, many of them gypsies, prostitutes, drunkards and robbers who had no relationship with the Church. ü 1974: The Congregation for Divine Worship, while preparing the reintroduction of the catechumenate for adults (known as RCIA), publishes a laudatory note, “Praeclarum exemplar,” (wonderful example) and settles on the name “Neocatechumenate” to indicate an itinerary of post-baptismal formation for those who are baptized but not sufficiently catechized. ü May 8, 1974: Neocatechumenal Way is approved by Paul VI during a meeting with Argüello and Hernandez. 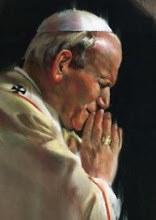 ü 1987: John Paul II opens the first Redemptoris Mater seminary in Rome to prepare priests for the New Evangelization; today, there are 100 Redemptoris Mater seminaries worldwide, with almost 2,000 priests already ordained and 2,000 seminarians in formation. Eight of those seminaries are in the U.S., including the one in Miami. ü 1990: Neocatechumenal Way is recognized by John Paul II as “an itinerary of Catholic formation valid for our society and our time,” and an instrument for the New Evangelization. ü Families in mission: Neocatechumenal Way sends families to areas on the periphery of cities, often immense slums, to form nuclei of evangelization and small communities that can contain the spread of Protestant sects until priests can be sent and new parishes founded. Currently, there are about 1,000 families in mission all over the world. ü Feb. 1, 2014: Pope Francis, meeting with about 12,000 members of the Neocatechumenal Way, sends 450 families in mission and 42 new missio ad gentes. ü Today, there are about Neocatechumenal 25,000 communities in 800 dioceses and 6,000 parishes in 124 nations, including 1,000 communities in 300 parishes and 75 U.S. dioceses. It is okay I will pass, I know that I need to know since 20+ years since it came to island, and what it has done to my family! "Jan. 17, 2011: Pope Benedict XVI approves the “Catechetical Directory of the Neocatechumenal Way.”"
No, the Catechetical Directory of the Neocatechumenal Way was "approved for publication". So where is it? Why can we not see it, as we can see everything thing else the Church teaches. Why is Cardinal Arinze's letter (the same one referenced in footnote 49 of your Statutes) not available on this site, but Mr Gennarini's commentary on it is? Mons. Juan Ignacio Arrieta's letter is in the website, which already included the things mentioned in Cardinal Arinze's letter. Dear Diana @ 12:33. That is incorrect. Mons Arrieta's letter does not cover all that was mentioned in Card Arinze's letter. Nor is it foornoted in the Statutes. Mr Gennarini's response to Card Arinze's letter is there - but the actual letter by the Cardinal is not. 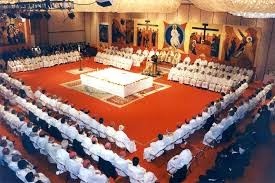 Incidentally, I notice that Mons Arrieta says nothing about the "sitting down" at communion. Also, you didn't answer the first question about the Catechetical Directory. Thanks. Could you specify what part was not covered? First of all, Zoltan (http://neocatechemunal.blogspot.com/2014/03/the-joyous-dancing-around-altar.html?showComment=1395882610689#c1014638673913509521) and yourself (http://neocatechemunal.blogspot.com/2014/06/neocatechumenal-way-liturgy-and.html) both misrepresent Mons. Arrieta's letter when you add this line: "The faithful receive the precious body while standing, take seat and wait until all have received. Then the celebrant says 'Body of Christ, bring us everlasting life!' and the whole congregation consumes immediately after the priest consumes the host." You will not find this on the official NCW website. Although, if it were true, or even if were possibly true, it would be there surely? We can assume it is not true, therefore. Secondly, Card Arinze's letter says this: "At least one Sunday per month, the communities of the Neocatechumenal Way must participate in the Holy Mass of the parish community." which is not mentioned in Mons Arrieta's letter. Nor is this: "Adherence must also be shown to what is set out in the “Institutio Generalis Missalis Romani” (nn. 105 and 128) and to the Praenotanda of the “Ordo Lectionum Missae” (nn. 15, 19, 38, 42). " Nor this: "Careful attention must also be paid to the Instruction “Redemptionis Sacramentum,” no. 74." or this: "In the celebration of the Holy Mass, the Neocatechumenal Way shall accept and follow the liturgical books approved by the Church, without omitting or adding anything"
If you sit to consume you have added. If you don't kneel through the consecration, you have omitted. Given that the Cardinal's letter is included in the Statutes, it is curious as to why it is kept off the official NCW page. Finally, you still have not dealt with the matter of the "approval for publication" of the secret Catechetical texts. I have already explained this over and over. We are not in contradiction with what was said in the letter. There are two ways to receive the Body of Christ in the Latin rite Church - either by tongue or by hand, We RECEIVE by hand standing up. What you disagree with is that we do not consume the Body of Christ "immediately" and we consume it "sitting" down. Are you going to measure how long "immediately" means so we can go by YOUR standard? Does it really matter that we wait one or two minutes before we consume the Lord's Body? As for sitting down to consume the Body of Christ, that instruction came from Kiko who received it from the Pope. In 2008, I remember Father Pius instructing us that we receive the Body of Christ standing up, then we sit down, and that this instruction came from the Holy See. The video that Tim Rohr published in his blog shows that the NCW in Guam is not the only one who received this same instruction. Everyone around the world (including the NCW in Rome) is doing the same thing. So, Rome is not ignorant of how we conduct our celebration. so why sit to consume and stand to drink? "It is not possible to be silent about the abuses, even quite grave ones, against the nature of the Liturgy and the Sacraments as well as the tradition and the authority of the Church, which in our day not infrequently plague liturgical celebrations in one ecclesial environment or another. In some places the perpetration of liturgical abuses has become almost habitual, a fact which obviously cannot be allowed and must cease." "The Mystery of the Eucharist 'is too great for anyone to permit himself to treat it according to his own whim, so that its sacredness and its universal ordering would be obscured'. On the contrary, anyone who acts thus by giving free rein to his own inclinations, even if he is a Priest, injures the substantial unity of the Roman Rite, which ought to be vigorously preserved, and becomes responsible for actions that are in no way consistent with the hunger and thirst for the living God that is experienced by the people today. Nor do such actions serve authentic pastoral care or proper liturgical renewal; instead, they deprive Christ's faithful of their patrimony and their heritage. For arbitrary actions are not conducive to true renewal, but are detrimental to the right of Christ's faithful to a liturgical celebration that is an expression of the Church’s life in accordance with her tradition and discipline. In the end, they introduce elements of distortion and disharmony into the very celebration of the Eucharist, which is oriented in its own lofty way and by its very nature to signifying and wondrously bringing about the communion of divine life and the unity of the People of God." "[92.] Although each of the faithful always has the right to receive Holy Communion on the tongue, at his choice, if any communicant should wish to receive the Sacrament in the hand, in areas where the Bishops’ Conference with the recognitio of the Apostolic See has given permission, the sacred host is to be administered to him or her. However, special care should be taken to ensure that the host is consumed by the communicant in the presence of the minister, so that no one goes away carrying the Eucharistic species in his hand. If there is a risk of profanation, then Holy Communion should not be given in the hand to the faithful." The fact that Pope Francis ceased all investigations into the Neocatechumenal Way is grounds enough to show that all those allegations against us are false and unfounded. You can't see it because either you don't want to, or you are simply too lame to look up a publication. I have a published copy of the directory with isbn on it and I was able to find it on the publisher's website for sale. I have enough already of people saying that it is secret just because they do not have the capacity or will to find it. "1. The new manner of giving communion must not be imposed in a way that would exclude the traditional practice. It is a matter of particular seriousness that in places where the new practice is lawfully permitted every one of the faithful have the option of receiving communion on the tongue and even when other persons are receiving communion in the hand. The two ways of receiving communion can without question take place during the same liturgical service. There is a twofold purpose here: that none will find in the new rite anything disturbing to personal devotion toward the Eucharist; that this sacrament, the source and cause of unity by its very nature, will not become an occasion of discord between members of the faithful." Now, please tell me if it is possible for those present in the NCW Eucharist to receive communion on the tongue licitly, if communion is distributed prior to the priest's communion? I think it is obvious that the NCW manner of communion is in fact "imposed in a way that would exclude the traditional practice"